One of the greatest joys of Science Fiction in film and literature is the potential for a spectacle unlike anything seen before coming with each attempt at the genre. It is the genre that has brought us such mind-bending thrillers as MINORTIY REPORT and INCEPTION and has produced classic scores like BLADE RUNNER, a groundbreaking score for a groundbreaking film. Sci-Fi is the fertile ground from which the most original and stimulating films are born. With a sufficient suspension of disbelief, Sci-Fi can provide the ultimate in cinematic entertainment. 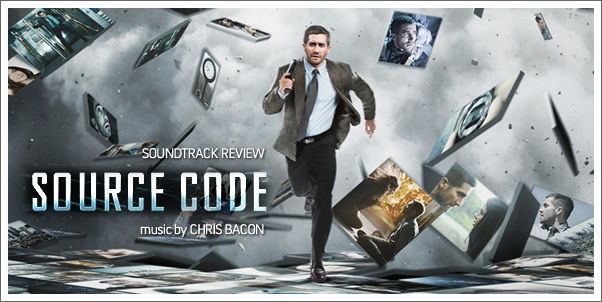 DUNCAN JONES’ SOURCE CODE is a film that requires such suspension, its original premise is one of outstanding potential and if MOON is anything to go by, it could be another excellent production from this up and coming young director. As the director continues to feel his way through the industry, it seems fitting that another young and promising artist has been chosen to score the film. CHRIS BACON, most notable for his working alongside JAMES NEWTON HOWARD, and providing additional music for such films as KING KONG and I AM LEGEND, scores his first blockbuster release in SOURCE CODE, and compared to his previous solo scoring credits (ALPHA AND OMEGA, LOVE RANCH), his music is naturally somewhat of a departure.